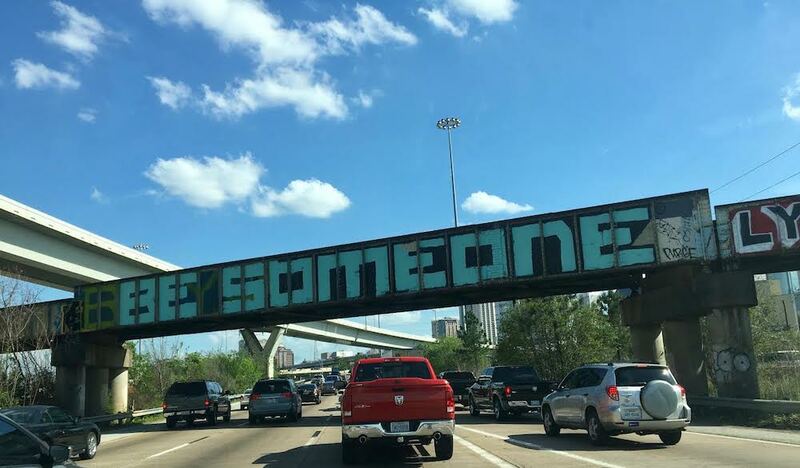 Look up to spot Houston’s hopeful “Be Someone” street art as you cruise down the freeway on I-45 South, just north of Downtown. Hovering just above southbound traffic on a tattered train bridge above I-45 South, the now-famed “Be Someone” graffiti has been greeting commuting Houstonians since it turned up out of nowhere in September 2012. Onlookers won’t need to try very hard to find the guerilla art piece, given that the inspiring message, scrawled in massive blue lettering, can be easily spotted smack dab in the center of the bridge just before the Downtown Destinations Milam Street exit and the four giant heads of David Adickes’ Mount Rush Hour. To this day, the artist behind the iconic tag remains (officially) anonymous, mostly to avoid what would be pending charges of vandalism. Although social media sleuthing can provide some insight. Regardless of accreditation, the artist’s work and message live on; commanding Houstonians to be the change (and person) they wish to see in the world. Though this commanding artwork easily makes for a great photo-op to add to an Instagram or Facebook timeline, we remind you that this work is only accessible via vehicle traveling southbound on the I-45 freeway. We encourage visitors to please refrain from trying to snap a photo while behind the wheel and navigating traffic. Rather, if you are going to try to take the perfect photograph, we ask that you be careful, plan ahead, and bring a friend to snap the photo from the safety of the passenger seat. And, because you can’t exactly stop to get the perfect shot, you may consider making your run on a clear day just before rush hour, when traffic under the graffiti slows to a crawl.